Jeremy & Michael's light and airy wedding published on equally wed! 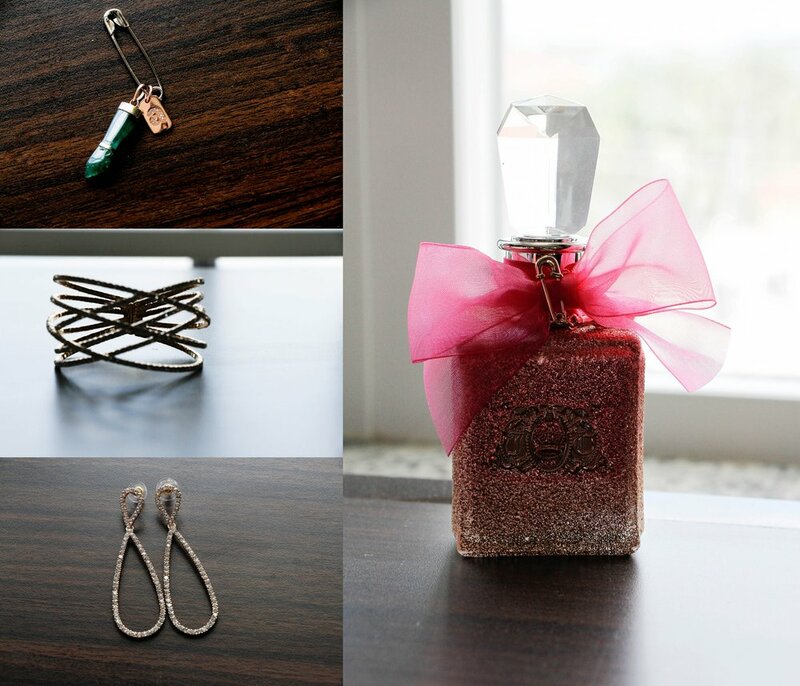 Jeremy & Michael's wedding perfection has been published on Equally Wed! 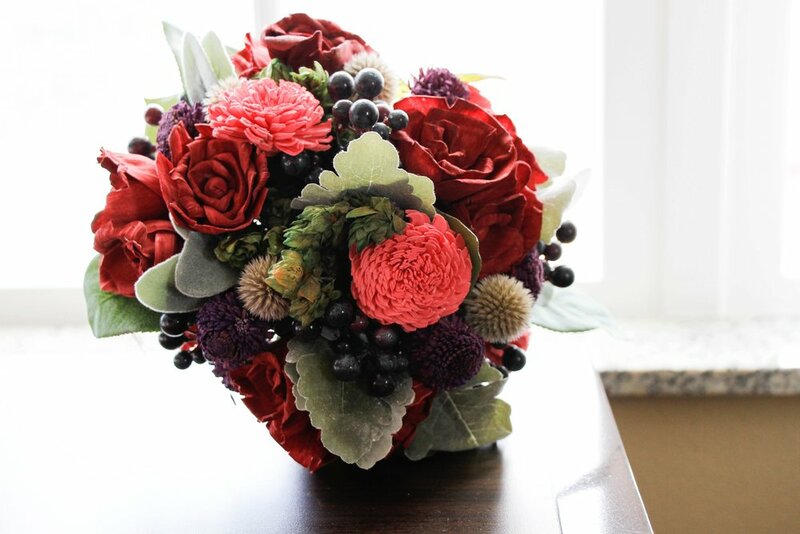 Stop by to see more from this sweet couple's big day! 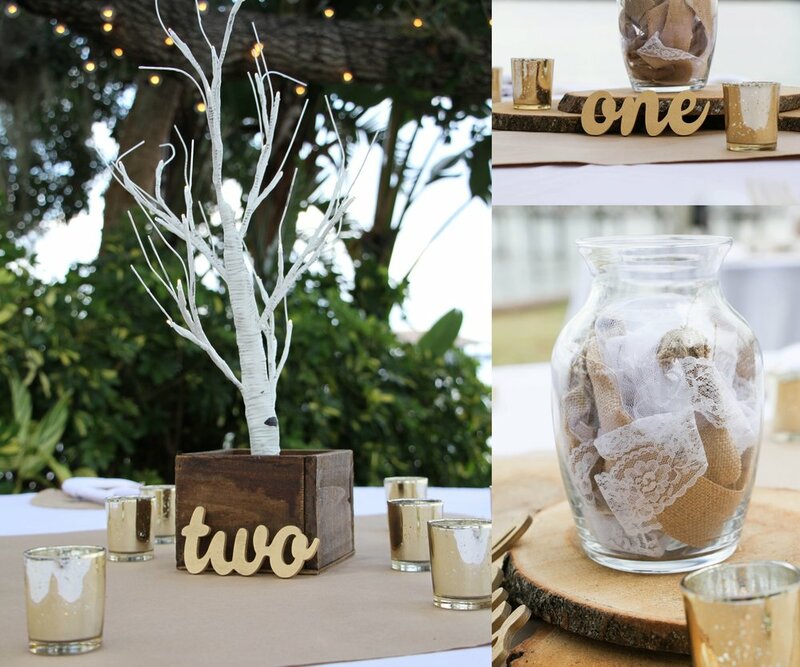 Kristin and Alex's wedding was, not unlike them, perfection. 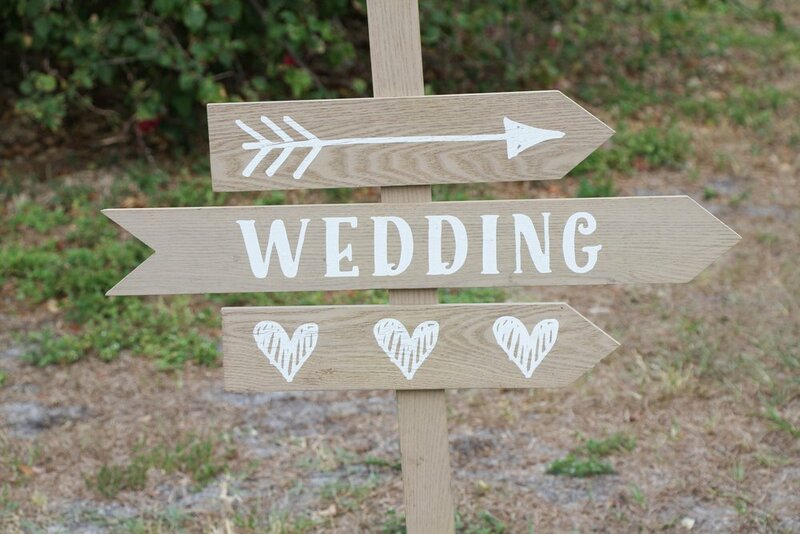 The bridal party began wedding-day preparation at a gorgeous, waterside hotel in the historic district of Bradenton, FL. Upon our arrival at the hotel, the girls were finishing up hair with the wonderful April of Classy Styles Hair & Makeup and makeup by the amazing Laura Smith-Cruz! The hair and makeup team absolutely slayed the girls' looks, they all looked flawless! 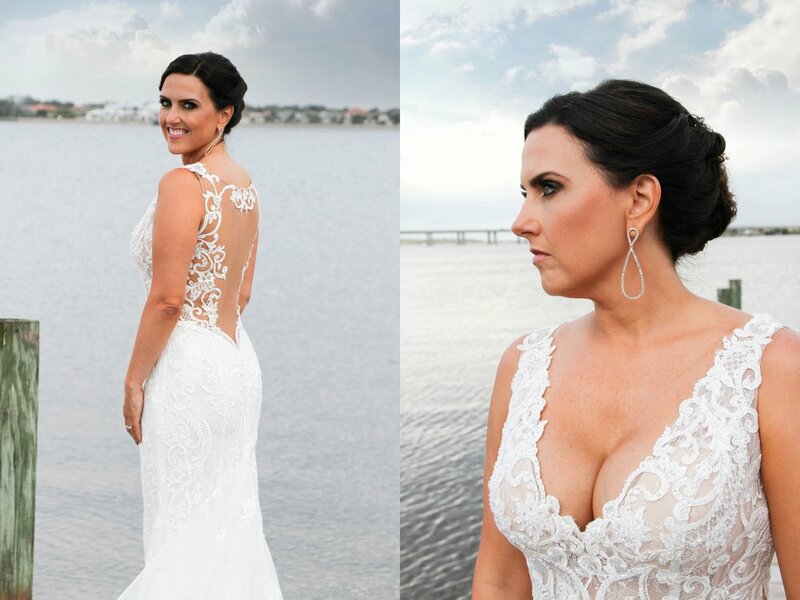 Kristin was the most gorgeous bride, she wore a mermaid-style, open back, lace gown that literally looked like it was made specifically for her! 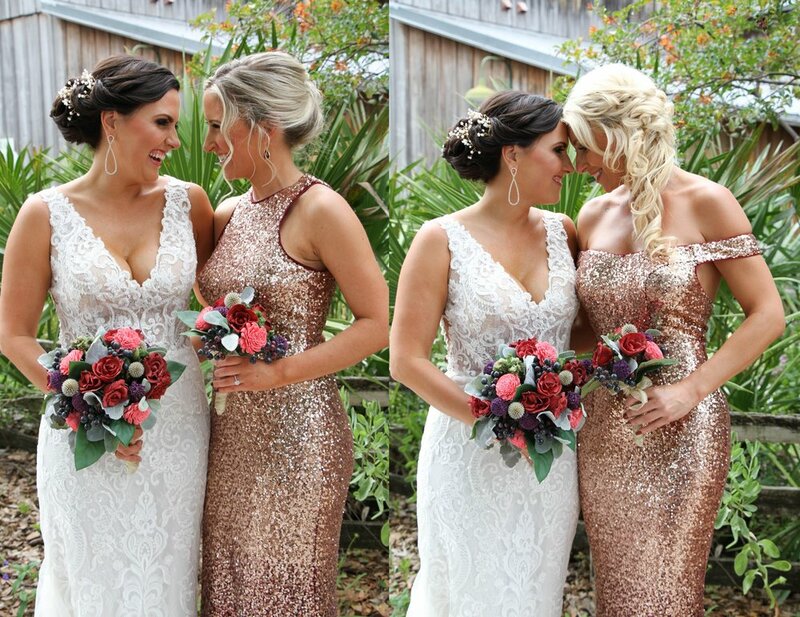 Her beautiful bridesmaids wore sequined gold and burgundy dresses that complimented her dress perfectly. 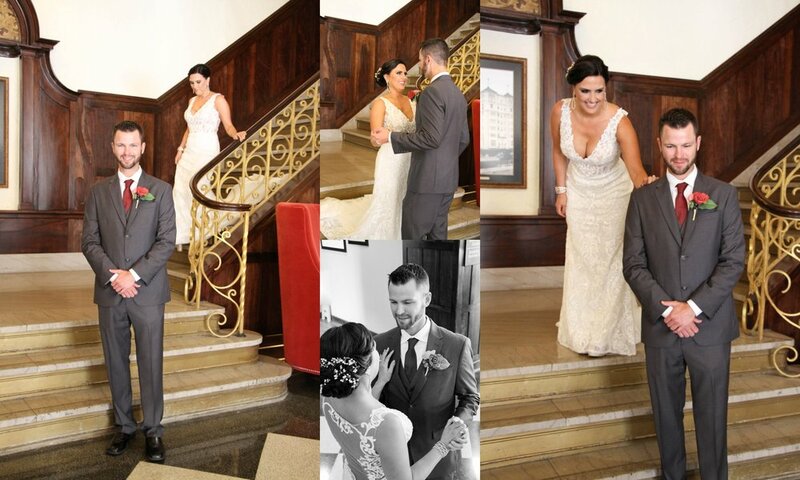 The hotel was complete with a sun-soaked, central grand staircase, which was the perfect location for Kristin and Alex's first look! 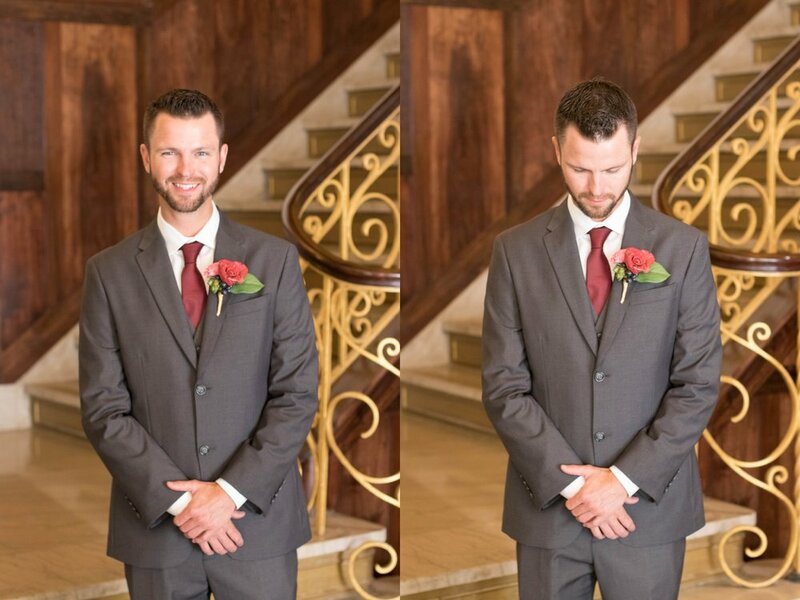 Alex stood at the bottom of the stairs and waited for his beautiful bride. The look on Alex's face when he turned around and saw Kristin for the very first time in her wedding dress was absolutely priceless!!!!! His actual words to me were "she looks like a dream"! Well said Alex, she certainly did! 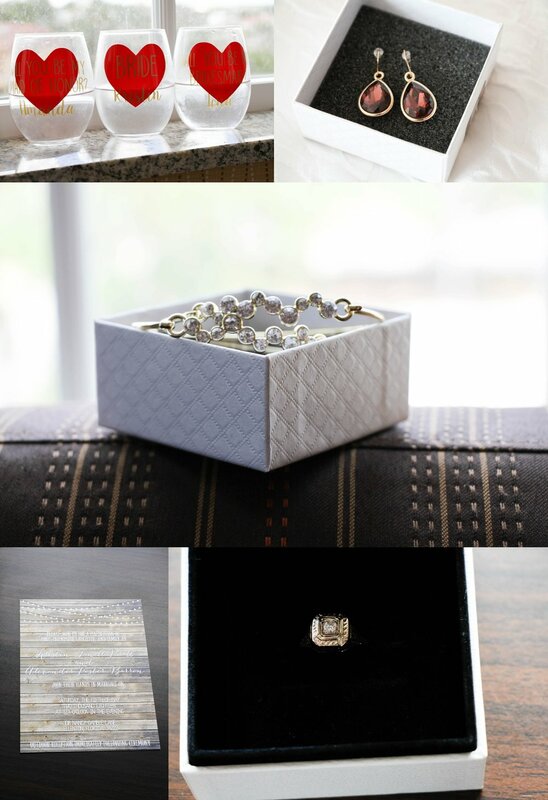 A bridal vision! After we took a few photos on that fabulous staircase, we headed to the Palmetto Historic Park with the bridal party. I had never been to this location before but let me tell you what, it was a photographers playground! Historic buildings, a church, schoolhouse and barn and cobblestone streets, perfection! We had a blast soaking in the versatility that this amazing location had to offer before heading out to the ceremony. 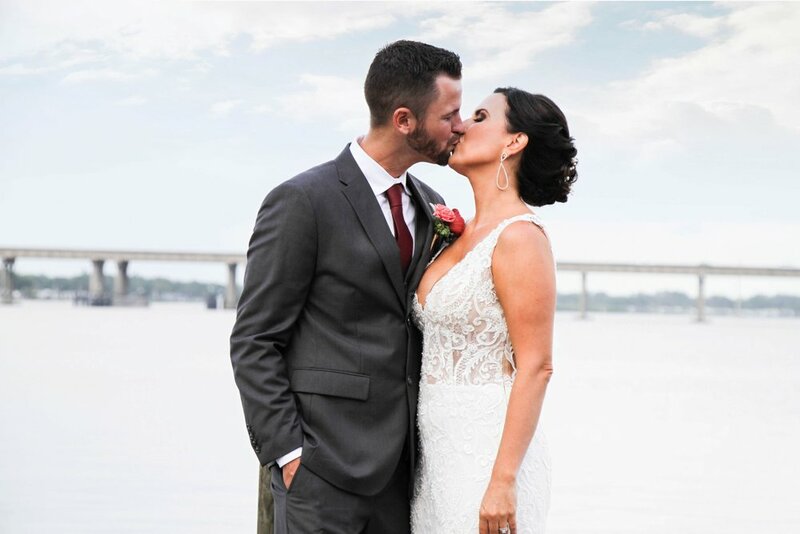 Kristin and Alex's friends offered up their AMAZING waterside home for their ceremony and reception location and it couldn't have been prettier! 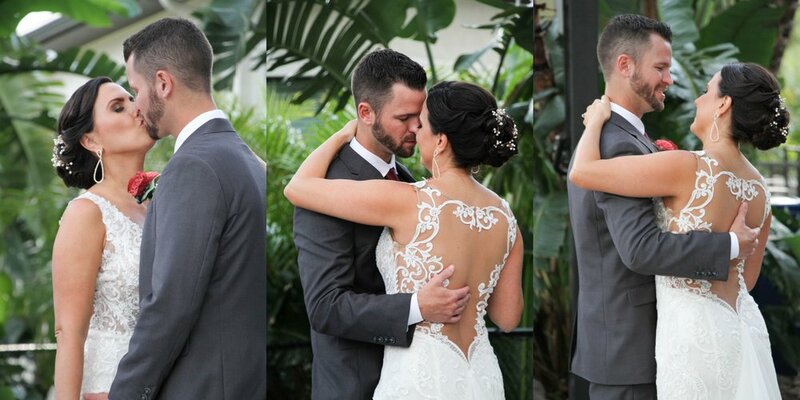 A lush, tropical garden adorned with twinkling Edison bulb string lights, burlap and lace place settings and scattered tea lights set the perfect ambiance for this sweet couples special day. Once guests had taken in the beauty of the location and all the special little details, seats were taken and the ceremony commenced. Kristin and Alex's good friend Sandra was their officiant and she did such a wonderful job with their ceremony. It was personal, heartfelt and beautiful. Prior to the wedding Alex didn't think he would cry....boy was he wrong! 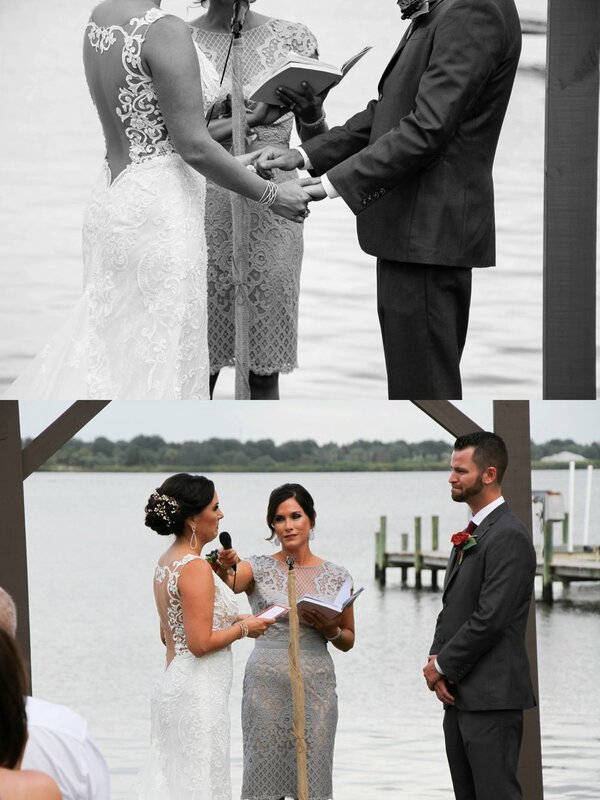 There were many happy tears, not only from Kristin and Alex but from the majority of their guests! 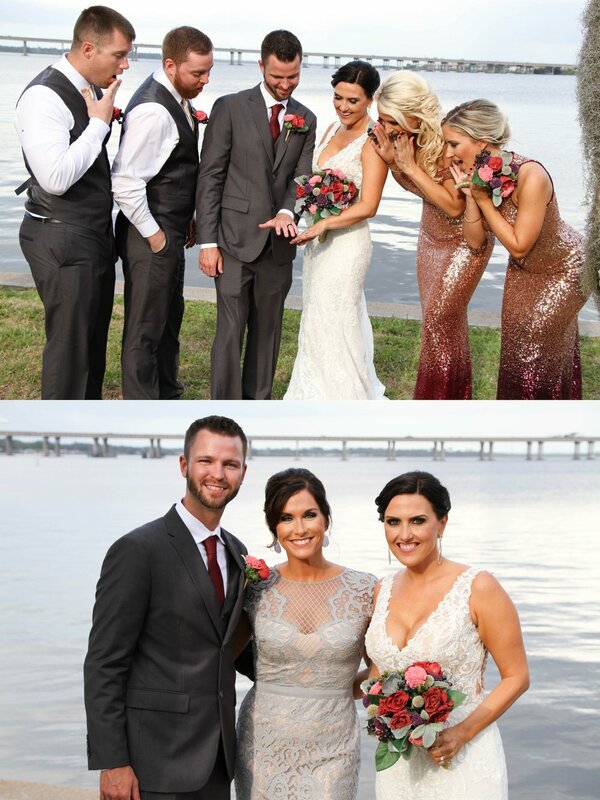 The pure happiness and love that everyone exuded towards the couple could be felt in the air! After the couple exchanged the most beautiful vows that they had written to one another, they were officially announced THE BARRON'S! We enjoyed the beauty of the location while shooting with the newlyweds before they were announced into their reception! 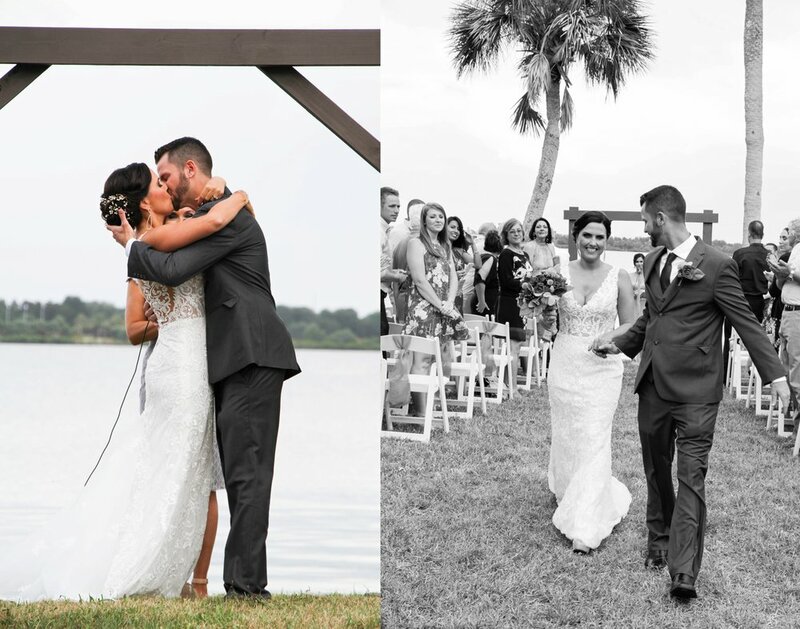 The couple danced to "To the moon and back" by Luke Bryan, which even had me in tears! The way Kristin and Alex looked at one another was something I will never forget! After all of the formal dances, guests were invited to enjoy a delicious gourmet meal provided by Gaston's Culinary Services. It was SO good! 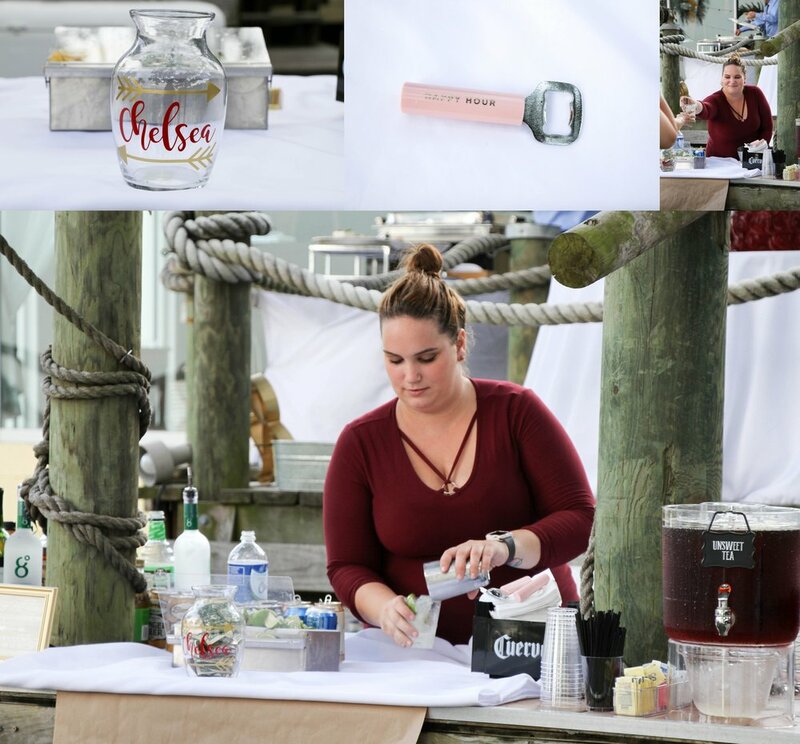 Kristin and Alex's beautiful and talented friend Chelsea, of Tipsy Tampa, did an incredible job with the bar services and making sure that everyones cup was full with their drinks of choice or one of the couple's signature drinks, "the Barron blue margarita" or the "Marry me mojito"! After dinner the celebration was in full swing, despite a little rain, the dancing and good times continued all the way up until the couples sparkler exit! 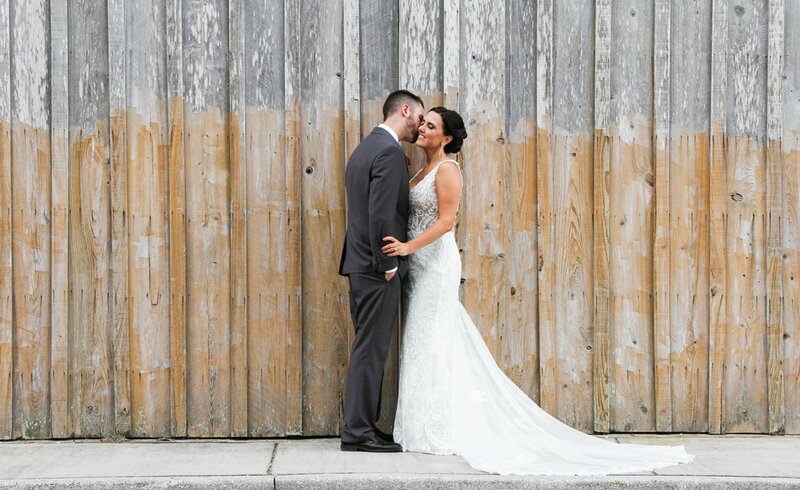 This wedding was filled with so much love, not just between Kristin and Alex, but also from all of their family and friends! It was an absolute honor to capture such a special couple's big day! We wish them all of the love, happiness and blessings that life has to offer as they embark upon their "greatest adventure" yet! Cheers!